I’ve got something on my squeaky mind right now, and I need some help. Maybe Beckeesh, maybe Nick, our other authors can help, but anyone’s help is gratefully appreciated. 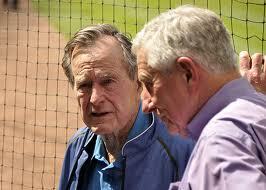 Okay, here it is, don’t flinch: Astros politics. I hate mixing politics and sports, except to say I can’t think of a greater bipartisan venue than our american past-time. Who cares who Hunter Pence voted for when he’s screaming his way around the bases for a game ending RBI double? One of my favorite things about baseball is the ability to leave it all on the field, no matter our wildly different views on national issues. BUT – BUT BUUTTTTT– I’m weary of the assumption of many affiliated with the Astros organization that every fan is a staunch republican by default. I’m not here to espouse any political viewpoints, but I do cringe when the Astros always acknowledge G. Bush 1 and his wife as if they are english royalty. I mean, granted, in Texas they pretty much are, but Houston is a diverse city, giving it a diverse fan base of Latinos and many others not generally associated with the white-collar oil syndicate. Not to bash the rich white Houstonians too much, I mean they are very important to the Astros existence, whether we like it or not, but many people, especially in Houston, have not forgotten Barbara Bush’s idiotic “sleepover” comments to the stranded victims of Katrina in the Superdome, and I, for one, am not ready to knight her grand dame of my favorite ballclub. At all. period. ZZ Top is a much better option for Astros Ambassadors in my opinion. And I’m too polite to even mention the Enron fiasco (oh, whoops!). "Barb's hot, could you close the roof?" Again, I’m not saying it’s not exciting to acknowledge a former president’s presence at the ballgame, it is, but I had to sit through Milo Hamilton’s long-winded praise for the Republican party, for G.W., and his dad, and some major figure associated with them as a speech writer (sorry, I forget the name right now, please feel free to help me out), this was DURING A BROADCAST, and it pisses me off!! I’d like to know what’s going on on the field occasionally, Milo. I mean, Hamilton, legendary as he is, has already become hard to listen to, between his confusion of play on the field and his persistent capitalism with every breath (that criticism is for another post however), and I don’t want to know his damn political views. It really turned me off, and I bet it chapped other Astros fan asses as well. I mean, republicans are why we have the Rangers, right? Or is that just me? So, between that, Berkman’s unabashed conservative views in years past, and the fishy political leanings of “Faith and Family Night”, I send out a plea to the other sides. I bet the Astros clubhouse, with their inner diversity, is amicably divided, and I’d like our fan base to create the same amicable division. Please let us know, through careful research or hear say or straight up gossip, which Astros/prominent Astros fans are democrats. Or independents. Who in the clubhouse or in the broadcast crew supports current President Obama? I’d like to even up the playing field. I want to see the “blue”, or the “green”, or hell, the “yellow” side of the Astros organization. It’s only fair to know, or to speculate on. Please fill the comment section with your thoughts on this! Then we can go back discussing, as one, how our squad keeps blowing late leads.